Once again, I'm late. I've been very busy the for last several days (news to follow :D) so my contest posts have slipped! So sorry! Did you read the fine print at the bottom? Did you? Cuz that's the funnest part for me! I got to write Luc and Gabe again! It's been a really LONG time since I wrote Last Rite, and it was super fun to get to hang out in my beautiful boys' heads again. I really miss them. So, the really super fun thing: for those of you who are able to make it to Beaverton on April 17th, you'll get to read about how Luc and Gabe first met in Pompeii! 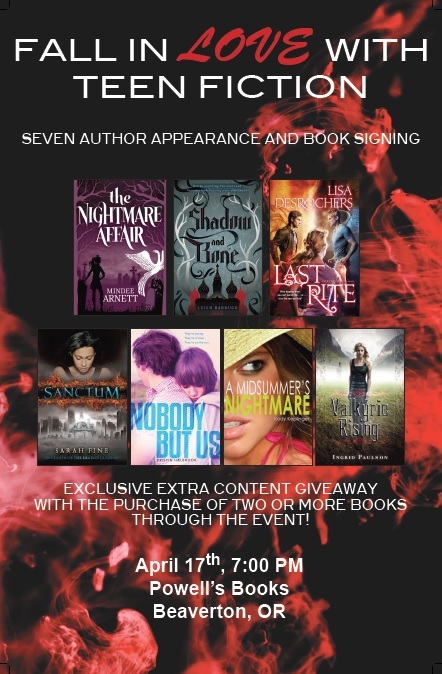 And if you can't make it to Beaverton, but you still want signed books, here's your fifth chance to win one! As I already mentioned, each weekly entry will get thrown into the pot for the GRAND PRIZE DRAWING on after the event on April 19th, which will include seven signed books (one from each participating author). Remember, entries DO NOT carry over from week to week, so even if you entered last week, you need to enter again to be eligible for the week 5 drawing. So, to enter this week's contest for a signed book by any of these lovely ladies, just fill out the form below before Friday, March 29th at noon PST. If you post links and send your friends, you get bonus entries which all get thrown into the GRAND PRIZE pot for seven signed books! And, one extra entry if you comment below and tell me what your favorite book of all time is. And now for the winner of last week's contest. I almost never know what to answer at this question. My book preferences changes a lot every time I read something else I like. But now I will have to say that I have a soft spot for Love Lines by Diana Nixon. Eeep what an awesome event! And I have lots of favorites. My favorite classic would be To Kill a Mockingbird; favorite YA novel is This Lullaby by Sarah Dessen. I actually don't have the favorite book of all time, 'cause it's literally impossible to choose just one. However, the one that really enthralled me is The Fault in Our Stars by John Green. My favorite is A Wrinkle In Time by Madeline L'Engle. Totally love that book! It's difficult but I'll choose The Alchemist of Paulo Coelho. The first book I've read and the reason why I love reading. I first read it when I was six. The Harry Potter series. I can't just choose one. I love so many books so it's hard to say. Either Delirium or Across the Universe. That is a hard one because like all readers I have more than one so I will go with what just pops in my head... and that is "The Darkangel" by Meredith Ann Pierce. Too many awesome book but one of my favorite from the top of head would be Magic Strikes by Ilona Andrews (Kate Daniels series). My favorite book right now would be MILA 2.0 by Debra Driza. I like too many books to choose just one. That's a toughy! Harry Potter and the Goblet of Fire is probably towards the top of my list...as is Alanna by Tamora Pierce, Fire by Kristen Cashore, and The Wizard's Dilemma by Diane Duane. I really put them all down because of life but never want to put them down :). I think it would be IMMORTAL RULES or UNSPOKEN.